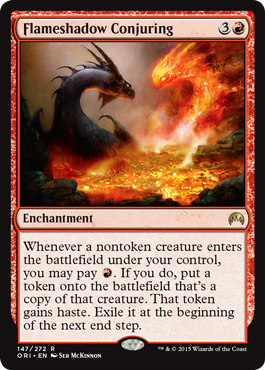 It may be 'Taco Tuesday' to Lego-philes but here at MTG Realm, we are serving up more hot 'n' fresh Magic Origins spoilers and previews for all the rabid Magic: the Gathering gamers out there. Here is today's installment as collected from the mothersite and around the interwebs. 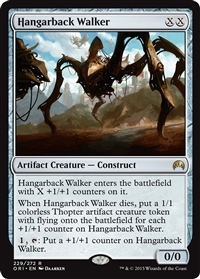 1,T: Put a +1/+1 counter on Hangarback Walker. MTG Reddit preview. Apparently we may make use of Windstorm from Khans of Tarkir with all the new thopter critters appearing in Magic Origins. Hangarback scales to late game but does not float our boat. Put four 2/2 white Soldier tokens with vigilance onto the battlefield. Spell Mastery - If there are two or more instant and/or sorcery cards in your graveyard, creatures you control gain indestructible until end of turn. Magic Japan preview. 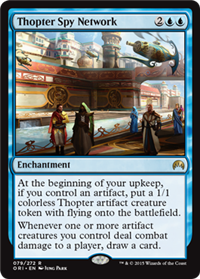 Too mana-expensive for standard but Commander fans may find the 'spell mastery' tech useful against board-wipes. • Disciple of the Rings gets +1/+1 until end of turn. PlanetMTG german preview. Nice control options which may sway late game play in your favour. Smells combo-riffic. 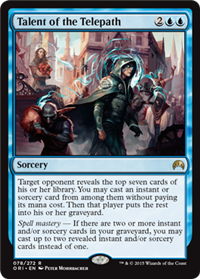 Spell mastery - If there are two or more instant and/or sorcery cards in your graveyard, you may cast up to two revealed instant and/or sorcery cards instead of one. Mothersite preview. 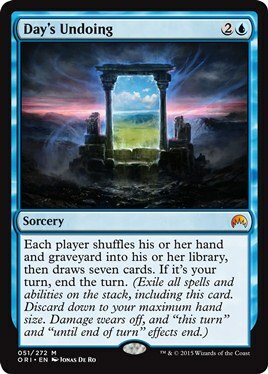 Damn fine card here which is certain to see play in multiple formats. TCG Player preview. Meh - recursion is nice but not at this price. 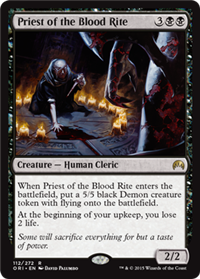 When Priest of the Blood Rite enters the battlefield, put a 5/5 black Demon creature token with flying onto the battlefield. Mothersite preview. 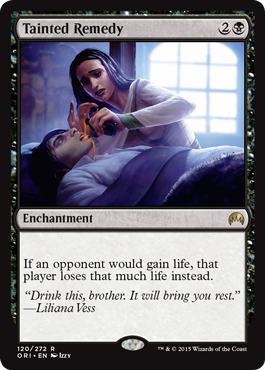 We can get on board with this powerful spell, even with the life-loss - we suggest you kill this priest off to more fully enjoy the token it produces. Hobby Consolas revista juegos preview. There may be a sweet place in a blue / red Izzet list which may allow you to manipulate the top of your library. Whenever an opponent casts a noncreature spell, if Scab-Clan Berserker is renowned, it deals 2 damage to that player. 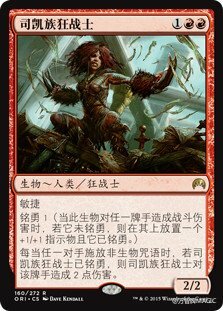 iPlayMTG simplified Chinese spoiler. Decent card - never underestimate the power of damage generated by static abilities. Reveal the top X cards of your library. Put all land cards from among them onto the battlefield tapped and the rest on the bottom of your library in any order. Spell Master - If there are two or more instant and/or sorcery cards in your graveyard, untap those lands. Mothersite preview. Solid mana-ramp tech here - perhaps a green / red build may be beneficial. G, Sacrifice a creature: Reveal cards from the top of your library until you reveal a creature card. Put that card into your hand and each other card revealed this way on the bottom of your library in a random order. 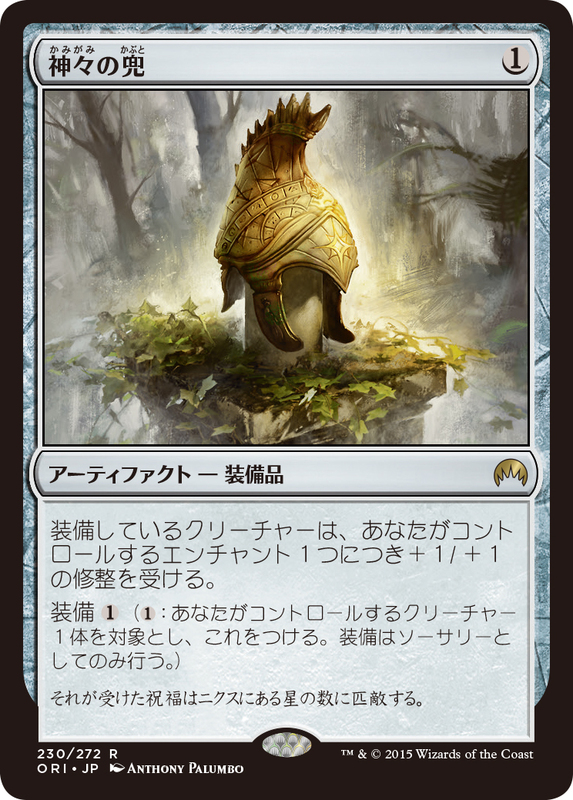 Hareuya MTG Japan preview. Not a bad way to dig for a creature to answer a stalled board state but perhaps leaving a bit too much to chance here. 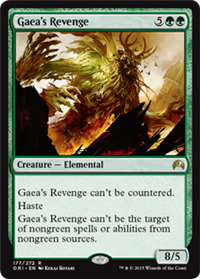 Gaea's Revenge can't be countered. WotC Elaine Chase preview. 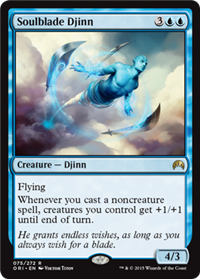 Sweet beater promising to side-step a number of control options - that mana cost though. 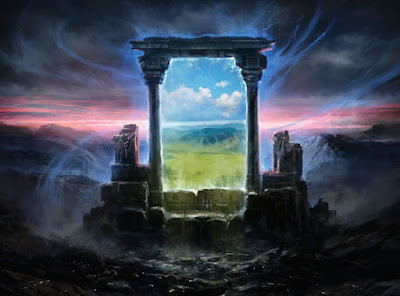 This is our second article today - to catch our earlier one covering off all the new Magic Origins previews out today, hop on over to here. 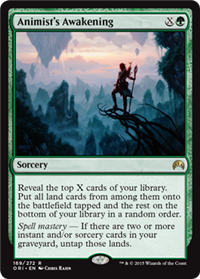 This, our second article is our particular interest to Magic: the Gathering players who may be attending this year's San Diego Comic-Con 2015, running July 9th to the 12th. SDCC is typically when we have a panel from Wizards of the Coast addressing several upcoming products, foremost of which is the next block - this being Battle for Zendikar. 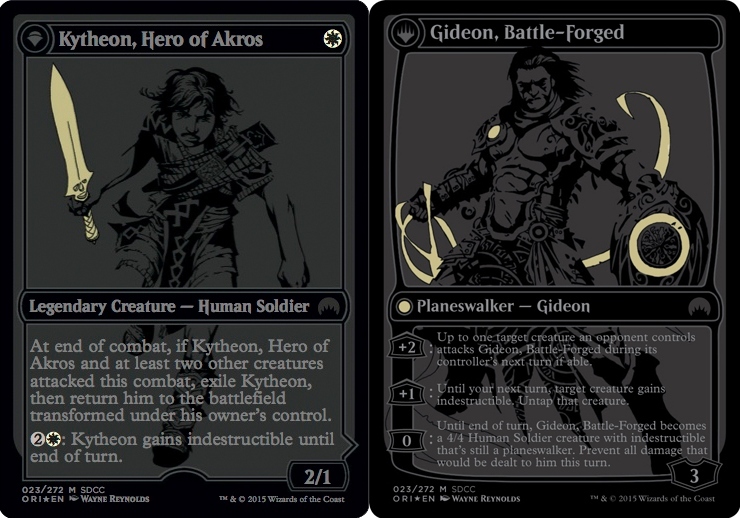 In past years, WotC has also released an SDCC Exclusive in the form of an alternate 'black on black' set of the core set Planeswalkers. At San Diego Comic-Con 2015 the Hasbro ToyShop offered a limited edition collection of double-faced planeswalkers cards from Magic Origins (the last core set) for sale. 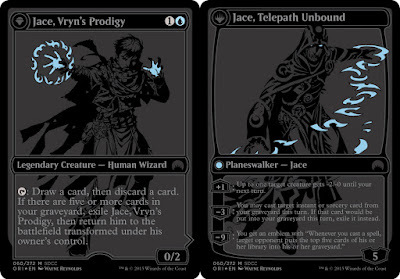 The five cards were presented with unique "black-on-black" illustrated by Wayne Reynolds. 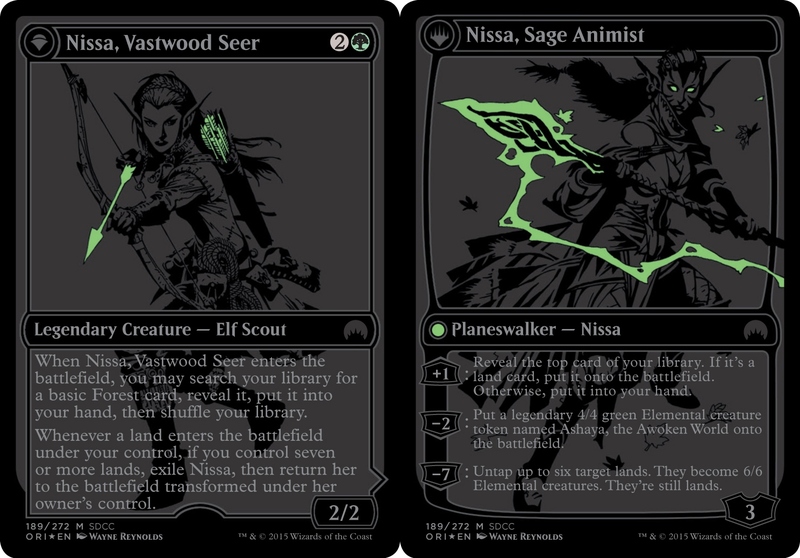 This year’s SDCC Planeswalker set also includes a book exploring the backstories of the five planeswalkers featured in this summer’s Magic Origins expansion: Chandra, Jace, Nissa, Gideon, and Liliana. This is expected to be selling at $120. A ton of new Magic Origins cards to talk about today from the mothersite and a number of preview outlets. Of note is an interesting proposed change to the mulligan rule, game table card layout for coverage and basic land arts for Magic Origins. We'll yatter about this latter when things slow down after official previews but for now, the change for mulligans is not much changed other than that at the beginning with the starting player and proceeding in turn order, any player whose opening hand has fewer cards than his or her starting hand size may scry 1. For now, let's get on with the new cards. 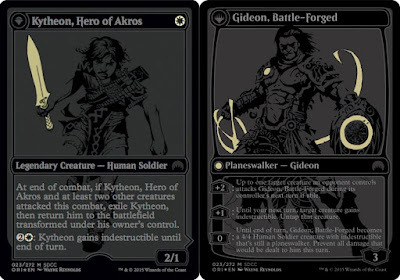 Magic Judges Blog preview. This is a kick in the tenders for Collected Company in standard and provides sweet sideboard against a number of popular Modern lists which may rely on re-animation, tokens and what-not. Mothersite preview. Lovely card for Commander and casual builds and we'll want to play this. You may cast Harbinger of the Tides as though it had flash if you pay 2 more to cast it. GP Singapore preview. 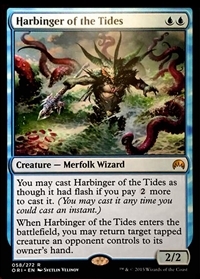 Nice card which may combo well with some Modern Merfolk strategies. Suggested serving with Merrow Reejery. 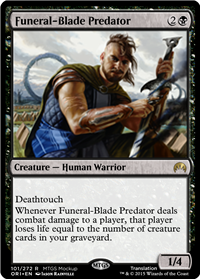 Whenever Funeral-Blade Predator deals combat damage to a player, that player player loses life equal to the number of creature cards in your graveyard. Metagame.it preview (Predatore della Lama Funerea). 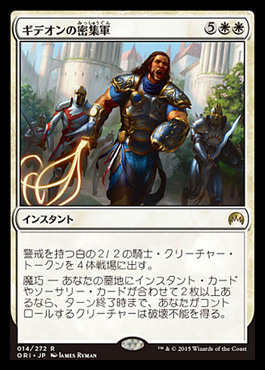 We love standard warriors and we love this card. Great design here. TopLevelPodcast.com preview. SWEET. This nasty piece of cardboard is certain to kill your opponent's win-con combo. 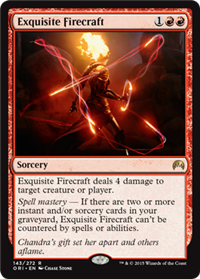 Whenever another Red source you control would deal damage to a permanent or player, it deals that much damage plus 1 instead. Le Monde France preview (Monstruosité braisegueule). Rather nice as the ability is not limited to burn spells but also creatures. Trample on this is a pinch weird though. If you can't take the heat...well, that's going to be a problem. Mothersite preview. There may be some rather narrow application beyond standard where this may shine, but for now, we can't take this heat. 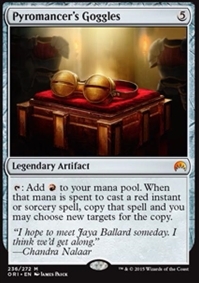 T: Add R to your mana pool. When that mana is used to cast a red instant or sorcery spell, copy that spell and you may choose new targets for the copy. 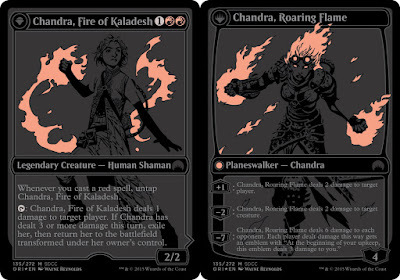 ChannelFireball preview. 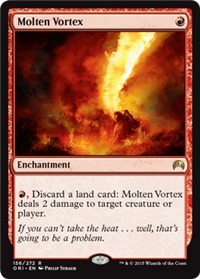 Solid card in a variety of formats with red burn at its center. 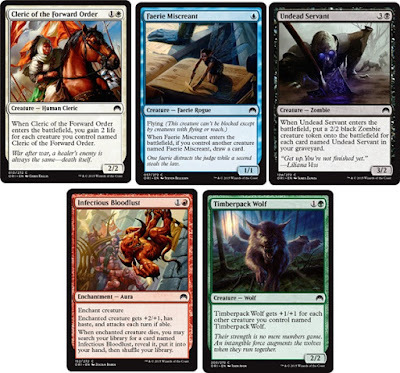 Getting to five mana rapidly we think would be key. OP as heck when Melek, Izzet Paragon is online as Commander. Commandzone podcast preview. Bad card is bad - we thought this may make the cut into a rampy Commander list but think our mana is better spent elsewhere. 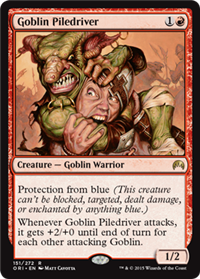 • Goblin Glory Chaser - 1/1 red gobby with menance if renown. 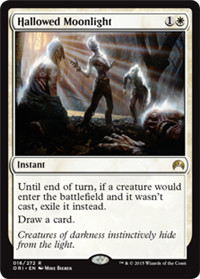 As it is Friday, we encourage you to leave your cave the seek out other humans to get in some Magic: the Gathering gaming. We'll be off to our local LGS here in Barrie, Ontario - OMG! Games, where we hope to become a Friday Night Magic Hero again. 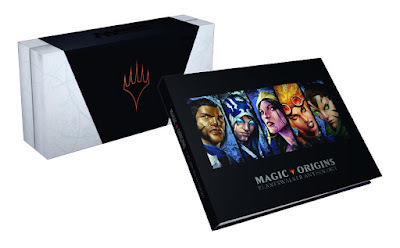 The end of week one of two of official Magic Origins is closing with 142 of 272 now accounted for and we will need to cover off all the new cards previewed on the interwebs today. To catch the card image gallery (now updated with yesterday's clutch of new cards), pop on over to this link. It's the favorite mount of military commanders, as well as anyone with a flair for the dramatic. Manadeprived Preview. 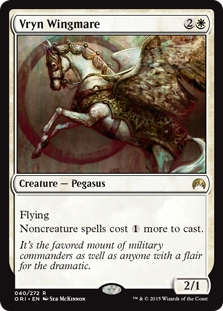 This Pegasus is certainly taking a leak on control decklists, and although decent in sideboards, would not really find a good home in the anticipated standard with aggro lists. 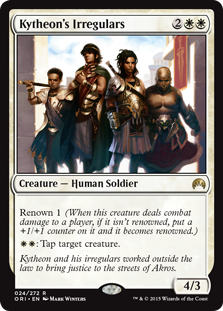 PureMTGO preview. Great reprint from Shards of Alara. Decent mono-white weenie. 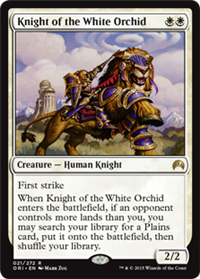 Suggested pairing outside of standard is with Knight Exemplar. Mothersite Preview. We'll need to brew a few lists, perhaps with elemental tokens from Master of Waves. Mothersite Preview. SWEET! 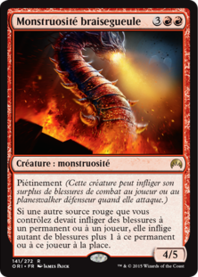 Reprint from Onslaught and we are glad for it. Goblin Rabblemaster may have been in the backseat recently but dust those off before rotation. • Dwynen's Elite - meh. 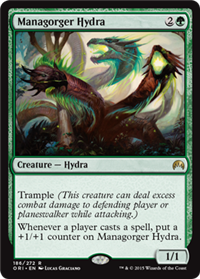 • Gnarlroot Trapper - nice card in your g/b elf-guild. • Shaman of the Pack - damn good finisher - go elves! 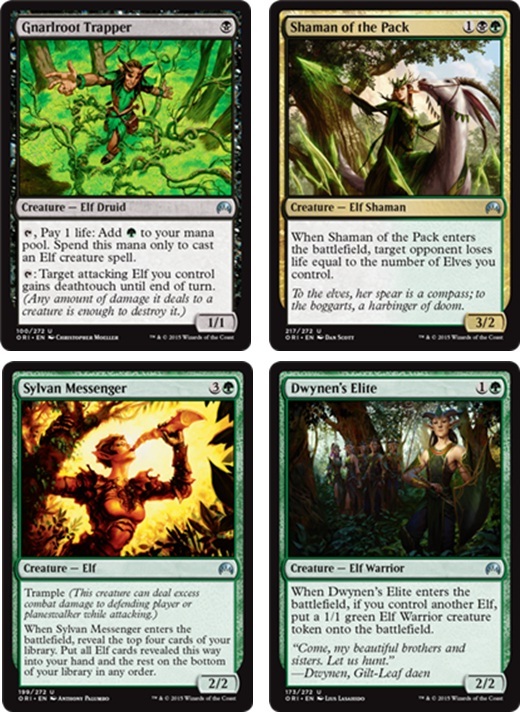 • Sylvan Messenger - ok, perhaps a modern tribal tech? - meh. 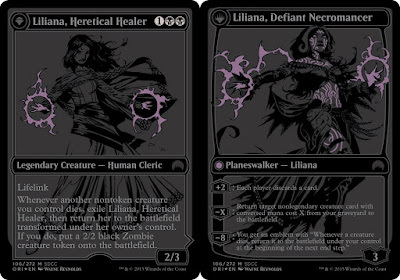 Another slew of Magic Origins previews out again today which should make Magic: the Gathering players rather happy. Perhaps the big news from the mothersite is what we are to expect for this core set's rare land cycle - so let's read on ! Twitter Preview (Walk the Planes?). 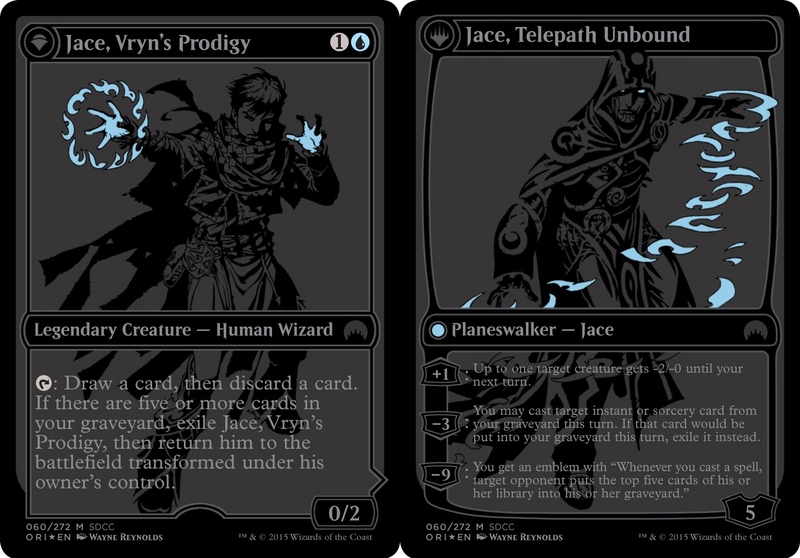 This design reportedly based upon the WotC 'You Make the Card' (YMTC) event. Great design and all modes are very cool, including the last one. The blessings conferred by it rival the number of stars in Nyx. Big Magic Preview. 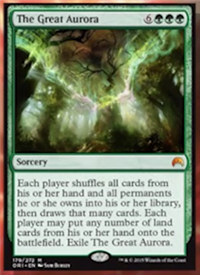 Ermagherd Enchantress artifact goodness, and yes, we will want a few copies of this one. 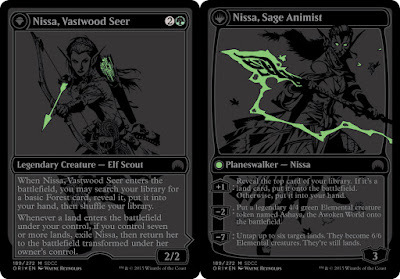 Gathering Magic preview. 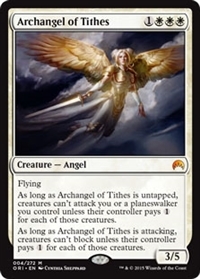 Mythic Rare is mythic and promises to have an immediate impact as soon as it lands and sticks to the battlefield. 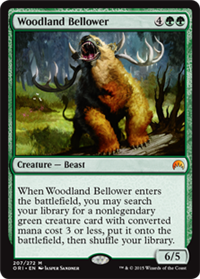 When Woodland Bellower enters the battlefield, you may search your library for a nonlegendary green creature card with converted mana cost of 3 or less and put it onto the battlefield, then shuffle your library. Magic EU Twitter preview. 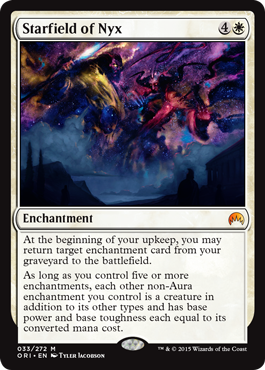 We like this but cannot imagine very much influence this may have upon standard constructed when the tutor is limited to a 3CMC. Mothersite Preview. Rather decent burn with conditional 'un-counterable' text. Mothersite Preview. 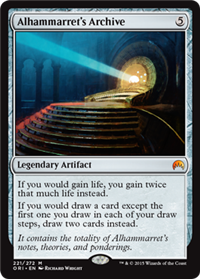 We are much excited to apply this to a Commander deck we have. 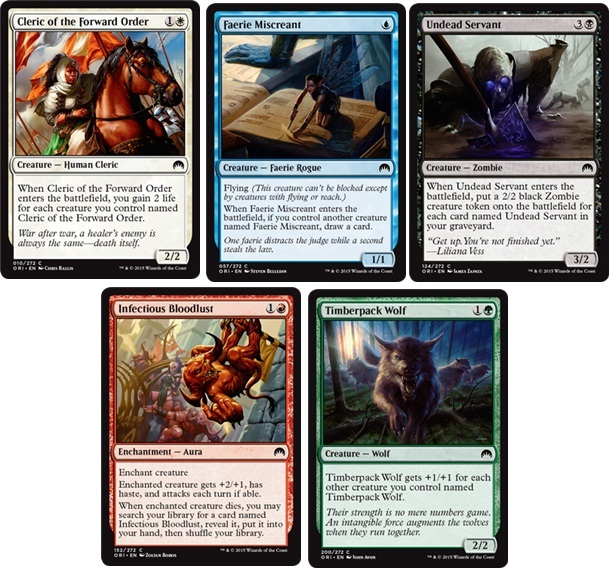 Enemy colored painlands: five rare dual lands with "Tap: Add 1 to your mana pool. Tap: Add C or D to your mana pool. This card deals 1 damage to you." Here, C and D are enemy colors of mana — Caves of Koilos, Shivan Reef, Llanowar Wastes, Battlefield Forge and Yavimaya Coast (reprinted from Magic 2015). Citadel Castellan, Valeron Wardens and Unholy Hunger. We suggest you make tracks over to the mothersite to take in today's Uncharted Realms installed as it speaks onto Jace's Origin (Absent Minds), as written by Kelly Digges. 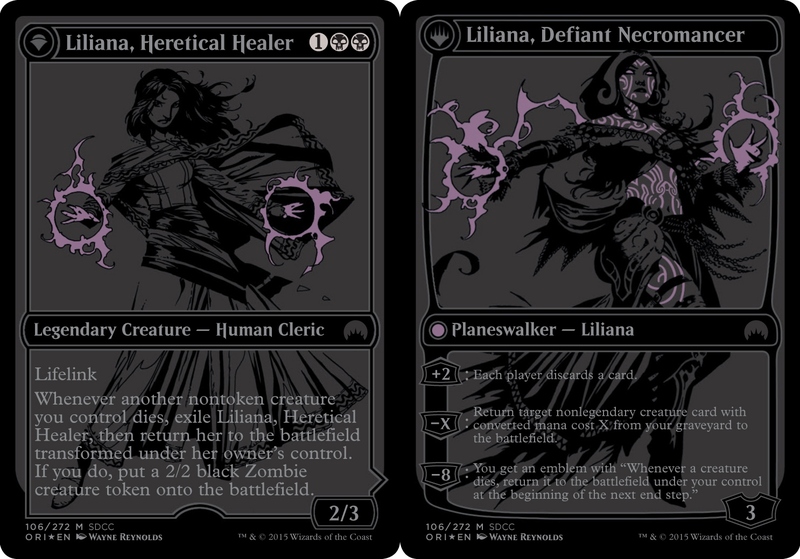 There is a good number of very lovely arts which may in all likelihood make their way onto new Magic: the Gathering cards in the new set Magic Origins. As we've seen in previous articles, the story follows the young person's life until they become the iconic Planeswalkers we know. Whenever you cast an instant or a sorcery spell, scry 1. Very nice card which will likely see popular play no doublt. Leftover stragler from yesterday. We love us a beat stick that promises to grow. Norske Magic preview. 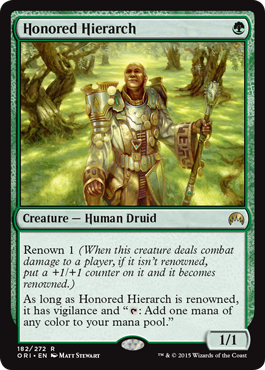 This may be a nice pick in limited and a lovely addition to Commander to tap down threats. Any player running an enchantress type of decklist will certainly be pleased with this. 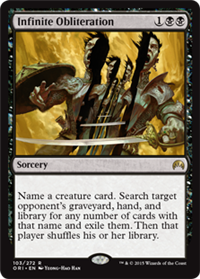 Each player shuffles his or her hand and graveyard into his or her library, then draws 7 cards. SCG preview. Wow - blue control has another utility in the tool belt here. 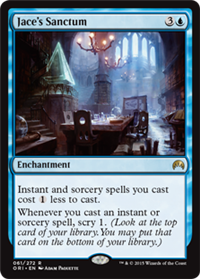 Diabolic Tutor cost one more but we love that for just one more we can get a decent benefit from spell mastery here. Powerful effect but really only fitting for sideboard tech. Damn fine card here and likely to cause all sorts of entertaining shenanigans on the game table. 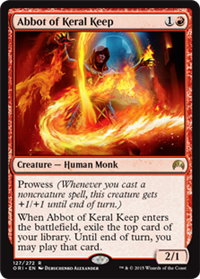 We rather like this mana dork and will want to acquire a deck set. Certainly no BoP or Noble Hierarch but this suites us just fine.